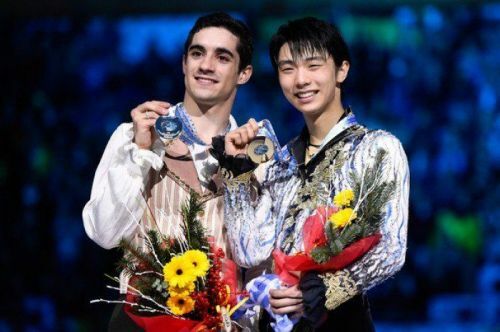 Japan’s Yuzuru Hanyu won gold in men’s figure skating on Saturday but it was his heartfelt interaction with long-time Spanish rival Javier Fernandez that made the fans emotional. The Spaniard, who was competing in his last Olympics. won the bronze medal and Hanyu couldn't hold back his tears when the two met after the completion of the event. Hanyu, who had also won gold in 2014 Sochi Olympics, became the first man in 66 years to defend his Olympic title. In this process, he also gave Japan its first PyeongChang gold. He finished nearly 11 points clear of compatriot Shoma Uno. It was the first time since 1972 that Japanese athletes have managed to secure top two podium places at a Winter Olympics. Hanyu also exhibited a golden gesture during the presentation ceremony when he asked Uno and Fernandez to stand right next to him on the top of the podium for the group photo. Hanyu is also a two-time world champion and he has won whatever there is to win in the field of figure skating. Some Japanese government officials have hinted at the possibility of giving the People’s Honor Award to Hanyu. Rivalries like these which turn into friendship are always great to watch. It’s a pity that the fans won’t be seeing the two great skaters turn up against each other in the next Winter Olympics. However, they can always watch the highlights of past events where these skaters have participated to relive the golden memories.